March brings the beginning of the spring planting season, and new arrivals will be coming in almost daily from now through June. It’s an intensely busy time, and, after this past winter, we understand everyone is more than ready to plant something…anything! 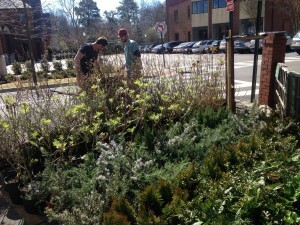 The first spring deliveries bring shipments of select shrubs. Because of space limitations we get them in first; it’s amazing how much room a blueberry bush or a Lady Banks rose in a 5 gallon pot can take up…especially noticeable when our entire operation is on 1/3 of an acre (Including the parking lot). Some shrubs in these first shipments are one time orders only, so don’t hesitate if you see something you like. 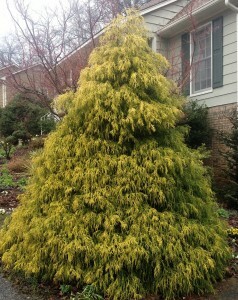 If you’re looking for a focal point in the garden, we have a chamaecyparis in now named ‘Golden Mop’. Shown here is a picture of one in my garden. If you’ve looked at pictures of some of our outdoor Christmas decorations using live greenery, you might be able to spot the bright golden foliage lighting up those holiday arrangements. 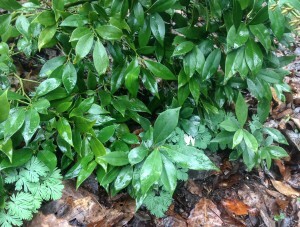 In March, the perennial groundcover Veronica ‘Georgia Blue’ makes a pretty skirt underneath it. We have some of it in stock now as well. 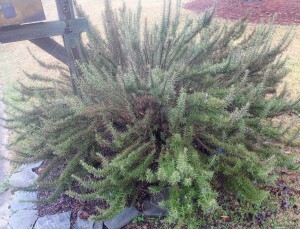 Do you need some new rosemary plants in your garden after this frigid winter? I do. With this in mind, we have tried to get in as many as we can. These first shipments will include large pots of upright rosemary to replace those so many of us lost. Remember to place your rosemary where it will receive at least 4 hours of good sun and won’t be in soil that stays wet for any great length of time. I’ve had a large one out by my mailbox for a number of years now (Inexplicably, it was the one that survived this winter.) that rarely gets much attention and is enormous. A couple more favorites of mine that we have now until they’re sold out are the wonderfully fragrant tea olives, Osmanthus fragrans. Their small white flowers aren’t noticeable until the elusive scent wafts through the garden in the late summer through fall and again sporadically through the winter. Plant these in a protected area in sun to light shade, ideally near entranceways or seating areas where the scent can be fully appreciated. On afternoon walks in the fall their scent is unmistakeable in my neighborhood! According to this link by UGA (Click on publications and search for osmanthus fragrans. ), they will grow to a size of 10-15 feet at a fairly quick rate. I started with a one gallon pot 9 years ago, and it’s easily at its mature height now. This is the only winter mine exhibited cold damaged leaves and bare stems; with spring, some fertilizer, and new growth they should be fine. One last shrub I’d like to mention is one you may not be familiar with; it’s an excellent for shade areas called Sweet Box, Sarcococca confusa. It will gradually spread in woodland areas and has clusters of fragrant white flowers in the spring, followed by round black fruit later in the season. 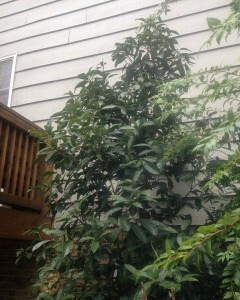 It’s a very nice evergreen shrub and useful as a filler or background plant. 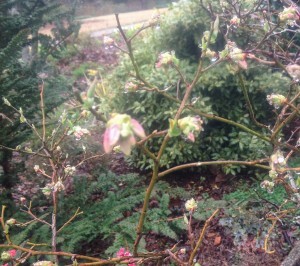 If you have a woodland garden, it’s a must! These are just a few of the new arrivals; others include confederate jasmine, figs (Yum!! ), Virginia sweetspire, Red Drift roses, bay laurel and more. If you’re in the area, please stop by and take a look! This entry was posted in Spring, Tree/Shrubs and tagged bay laurel, blueberry bushes, chamaecyparis, confederate jasmine, figs, golden foliage, osmanthus fragrans, rosemary, sarcococca, spring shrubs, sweetbox, tea olive on March 18, 2014 by Kris Blevons.